Face cleansing is not just about cleansing pores and removing impurities but it should be a lot more. OZ Naturals Vitamin C Facial Cleanser is made with the philosophy of not only deep cleansing pores and giving you that healthy glow but also reducing fine lines and wrinkles, fading sun spots, refining skin texture and providing you with some other benefits which people seem to love and you might not being expecting from just a facial cleanser. 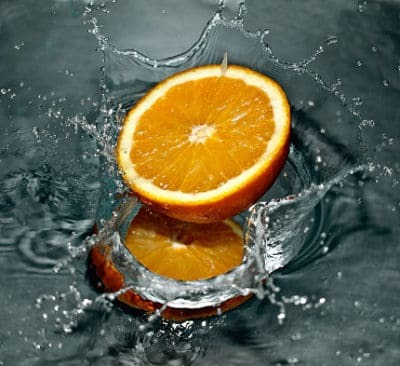 What Makes OZ Naturals Vitamin C Cleanser any Different from Other Face Cleansers? Even today a lot of people think that one way or another facial cleansers do the same job which is cleansing their face but all cleansers don’t do the same job and even more they don’t have the same benefits. The other day I tried out a good quality cleanser for my prone to few blemishes complexion. Of course, on its label it was written that it was for oily combination and prone to blemishes skin. Although I haven’t tried out several times to see the results but even from the first time of using it, I noticed that it made my skin a bit dry which is not good sign if you want to keep your skin hydrated and less prone to aging, fine lines and wrinkles. What I want to say is that although some people don’t pay enough attention to choosing a suitable face cleanser, a good cleanser is very important for not only keeping your face clean, but also hydrated and more resistant to aging. 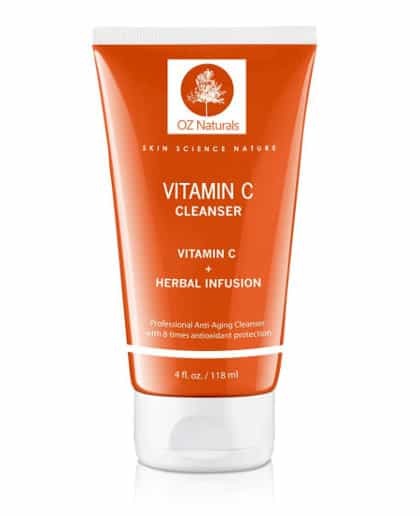 OZ Naturals vitamin C face cleanser doesn’t seem to be just a simple cleanser. While it deep cleans your pores, it also offers you anti aging protection with the vitamin C and rosehip oil it contains and at the same time keeps your skin hydrated with its herbal infusion which contains aloe vera. 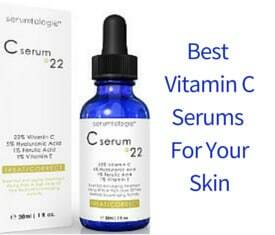 For better anti aging results, you can read more about the best vitamin C serums or even try doing your own serum using a vitamin C powder. Professional Anti Aging Natural Cleanser with 8 Times Antioxidant Protection. No alcohol, parabens and sulfates. Described as the best anti aging facial cleanser on the market, it promises to deep cleanse your pores while offering a strong antioxidant protection. This can result in 96% reduction of sunburn cells and protection from the damage caused by the free radicals. Vitamin C and organic rosehip oil promote the fading of sun spots and discoloration while reducing fine lines and refining skin texture. Organic Aloe Vera soothes skin and keeps it hydrated while overall the skin becomes more firm, healthy looking and radiant. The tea tree oil has anti inflammatory, anti septic, anti fungal properties and is used to treat acne, eczema, psoriasis and other skin conditions. It also gets rid of dead cells and is able to soothe a red and inflamed complexion. Organic Herbal Infusion,Organic Aloe Vera Leaf Juice, Decyl Glucoside, Cocamidopropyl Hydroxysultaine, Cocamidopropyl Betaine (from coconuts), Cocamide MIPA, Sodium Ascorbyl Phosphate (Vitamin C), Methylsulfonylmethane (MSM), Disodium Laureth Sulfosuccinate, Disodium Lauryl Sulfosuccinate, Carbomer, (2s)-2-Amino-5-guanidinopentanoic Acid, Olive Oil, Organic Rose Hip Oil, Borage Oil, Citrus Aurantium Dulcis (Orange Peel Tincture), Oregano Oil, Tea Tree Oil, Phenoxyethanol, Ethyl Hexyl Glycerin. Apply to your fingers or cloth, moisten with water and wash while giving a soft massage to your skin. Rinse off with warm water and continue with a serum and a moisturizer. 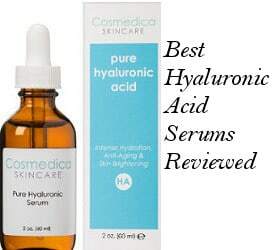 If you are using both a vitamin C serum and a hyaluronic acid serum, first apply the vitamin C serum, let it dry and continue with your hyaluronic acid serum. What Do OZ Naturals Vitamin C Facial Cleanser Reviews Say? Gently deep cleanses face. Users are thrilled with the way this cleanser removes all their face’s impurities like grime, oil and makeup thoroughly. Makes skin super soft and glowing. Another thing people love is how soft their skin becomes after using this product and with a nice glow. Less breakouts. Some users have mentioned that cleansing with this product has helped them reduce their breakouts. 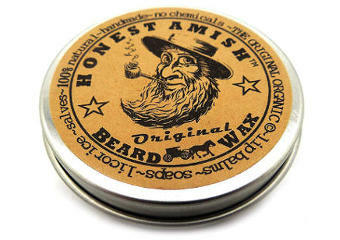 No dryness or burning feeling. People are glad that they don’t get any burning feeling which they had been experiencing with other face cleansers. Even users with sensitive skin report that they have had no sensitivity issues after using OZ naturals vitamin C organic cleanser. Feels and smells great. Users love the fact that this cleanser doesn’t leave any greasy feeling and makes their skin feel really vibrant, fresh and clean. They also love its very mild scent which is fresh and not the least overpowering. Effective for both women and men. Some men also seem to have been benefiting their skin by using this product since it can soothe and calm the redness of their skin after shaving without causing any dryness. Nice practical packaging. Practical tubing makes it easy for the content to be squeezed out and the tube’s orange color seems very attractive to people. The only drawback which one user mentioned, though, is that you have to prevent the product getting accidentally into the eyes because it can sting. 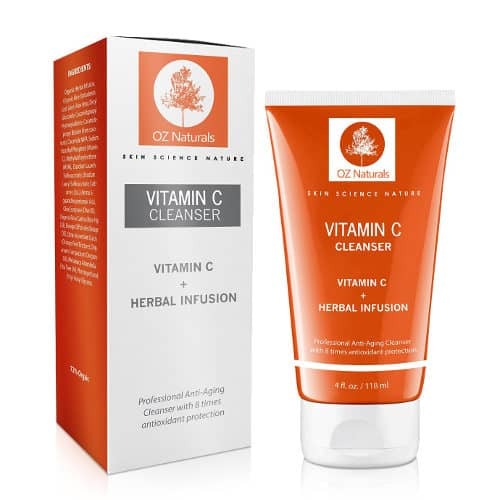 OZ Naturals Vitamin C Facial Cleanser seems to be very popular among users who really seem to be enjoying its benefits. This product gathers most if not all of the benefits one would want from their facial cleanser, some of them being thorough gentle cleansing, making skin soft and radiant with less breakouts and giving you a refreshing vibrant feeling that can be the best start for the beginning of a day.